Mayor Bill de Blasio is part of a growing socialist movement brewing in America. Read on to learn how it might affect you, your family, and your money. 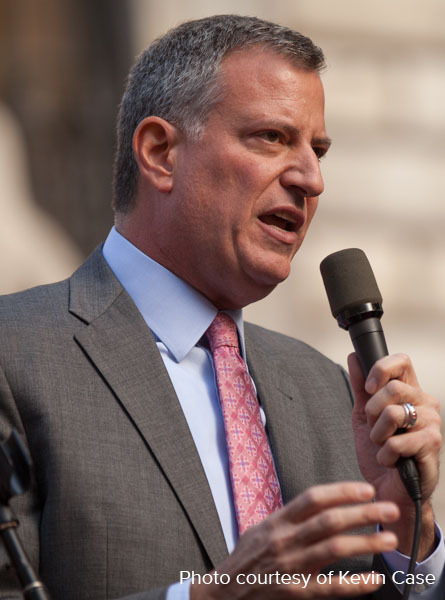 New York Mayor Bill de Blasio is part of a growing socialist movement brewing in America. Read on to learn how it might affect you, your family, and your money. In Congress, Senators Cory Booker, Kirsten Gillibrand, and Jeff Merkley are putting together a proposal in which the Federal gov’t would guarantee every American a job! Then there’s the new star in Congress: 29-year old Alexandria Ocasio-Cortez. She’s a former Bernie Sanders activist who supports just about every Socialist scheme imaginable… including free medical care, free college, and tax-rate hikes up to 70%. Nobel Laureate economist Paul Krugman has made the case that 70% taxes might be too low… he’s pushing for 80%!